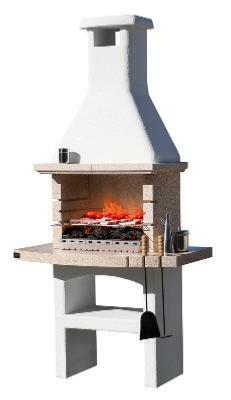 Outdoor barbecue with peach-coloured table top, shelf and fireplace. The main structure is made of concrete. The table and fireplace are made of granulated marble with a high quality crystal polished marble finishing. The barbecue has an integrated spit holder. Stainless steel grill (60 X 40cm) adjustable on four levels. Can be fired with charcoal and wood.